In a dramatic diplomatic turn, President Donald Trump on Thursday called off next month’s summit with North Korea’s Kim Jong Un, calling the cancellation a “tremendous setback” for peace and stressing that the US military was ready to respond to any “foolish or reckless acts” by the North. This spring, scoring a diplomatic win with Pyongyang had become Trump’s top focus. That had been a far cry from his bellicose rhetoric, issued both on Twitter and from the rostrum of the United Nations last fall. Trump threw off ominous taunts of raining “fire and fury” on the North while belittling its leader as “Little Rocket Man, alarming many global capitals and much of Washington’s national security establishment and increasing worries about nuclear war. But Trump believed his outside-the-box behavior would bring Kim to the negotiating table. Some observers raised concerns that Trump was risking legitimizing Kim’s government by agreeing to meet him on the world stage without evidence of denuclearization or other concessions. 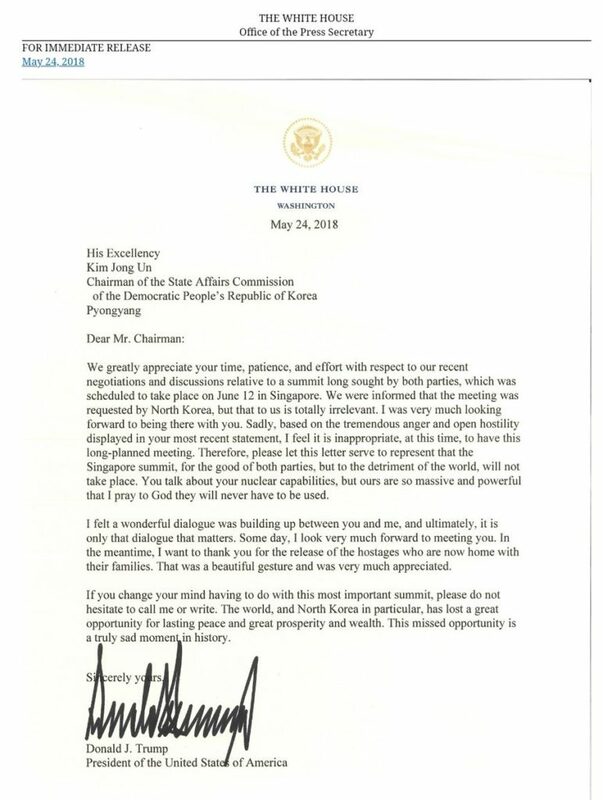 But Trump had bet big on the summit, telling one confidant that he believed a deal with North Korea, rather than in the Middle East, could be his historic victory. White House officials also believed that a triumph on the Korean Peninsula — something that has eluded the United States for generations — could bolster Trump’s approval ratings, help inoculate him against the investigations swirling around him and trickle down to help Republicans in this fall’s midterm elections.